I’ve been asked to write about the marauding Fulani herdsmen who have been causing havoc and mayhem where ever they go. This is a very sensitive and volatile topic that nobody will write about unless it’s about their murderous antics. But nevertheless let’s see what I have to say. Surprisingly I’ll sit on the fence here: a lot of blood has been shed on both sides; there are no winners or losers here, everybody is suffering. What you have going on here is the equivalent of opening up the floodgates to Hell: on the one hand you have a bunch of illiterate herdsmen protecting their livestock with everything they’ve got and on the other hand you got those protecting their lands from the trespassing herdsmen. And unless steps are made to keep them apart – permanently – there will be pandemonium for years to come. The proliferation of weapons in Nigeria and the inability of the security forces to control it means these otherwise ‘bow-and-arrow’ herdsmen now have access to a wide range of advance weapons – handguns, AK47s and god knows what else – to go on the rampage with. I don’t believe the killings are politically or religiously motivated since the herdsmen haven’t declared any allegiance to any political cause or party and they intend to kill anyone indiscriminately which rules out religion as a cause. That they were trained in Libya to come and wreak havoc in Nigeria seems to be a far-fetched unsubstantiated claim: without a political or religious agenda this doesn’t make sense. For those old enough to remember the Fulani herdsmen have always brought their herds down from the North to graze in the South before selling them. In the past they have done this in a peaceful manner without becoming a nuisance or danger to anyone. Then something happened , recently, that would turn them into rag-tag militant murderers burning down towns and villages and killing people. The thing that happened is called ‘progress’: whilst the rest of the country has moved on into the 21st century the mentality of the herders is still stuck in the 19th century – or even less! As we know, the Fulani herdsmen are nomadic and highly illiterate: they don’t stay still in one place to get a decent education or learn about the world around them. Their loyalty is only to each other and their herds – anybody else is their enemy. They also believe it is their God-given right to graze their herds where ever they see a green patch. The people in the South and Middle Belt have progressed further and the once open and vast green belts are now somebody’s front garden, farm, playing field or park – definitely not for grazing without permission from the owner. The illiterate herdsmen don’t know this (- or don’t care!) 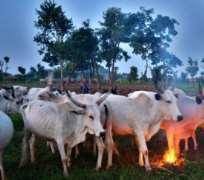 and continue grazing their ‘beloved’ animals and before you know it trouble erupts and escalates to big time wahala and people are killed. Now instead of the herdsmen to see this as a deterrent to them grazing on somebody’s land without permission they see it as a declaration of war. So next time they come down from the North with their herds they are ready to battle with anybody who gets in their way: and armed with AK47s, machetes etc they can inflict a lot of damage on a small community within a few hours. What is wrong here is their mind-set and with no one to talk to them or educate them about the dos and don’ts of the 21st century they will carry on. And in a country where there is a breakdown in law and order, where 80% of the active police force are assigned non-police duties such as guarding dignitaries and banks, anarchy is bound to prevail; so it’s no surprise Fulani herdsmen, Boko Haram, cultists and other miscreants are running amok. In the United Kingdom the government had a similar problem with a nomadic group of people called ‘travellers’ or ‘gypsies’. They would turn up out of nowhere with all their old vehicles and caravans and set-up camp where ever it suited them – be it a public park, school field or somebody’s front garden. Without a doubt this lead to incessant conflicts between them and the local residents. It got so bad that just like the Fulani herdsmen they came ready to do battle with anyone who got in their way until the government stepped in. The government’s solution to the problem was a very simple one: they established traveller’s parks outside of every major town so these people can go there whenever they’re on the move and passed laws forbidding them from going anywhere else. Problem solved! The travellers were happy and the local residents were happy. No more ugly confrontations and no more wahala. Sometimes the solution to a big problem can be something very small. There’s enough land in Nigeria for every major town to have a ranch or ranches outside the city boundaries to accommodate these Fulani herdsmen and their cows. Once you have these ranches up and running (- hopefully!) you make them go there and stay there, enforcing it with whatever means possible: enforcing their movement there is the key here; somebody needs to get it into their thick skulls that they can’t graze their cattle anywhere else. By the time you arrest and lock-up a few of them and seize their ‘beloved’ herds the rest will get the message. By doing this a lot of the bloodshed, happening on a daily basis, will be avoided. Branding them as terrorists or engaging them in running battles will only escalate the problem. Disclaimer: "The views/contents expressed in this article are the sole responsibility of Tony Ogunlowo and do not necessarily reflect those of The Nigerian Voice. The Nigerian Voice will not be responsible or liable for any inaccurate or incorrect statements contained in this article."